We have approximately 15 fig trees of various types, white, black, yellow, bright green ( even when fully ripe) and one that has green and yellow stripes. This year they have been prolific. I’ve processed over 30 kgs so far, mostly drying them halved or whole. I’ve made fig and orange jam, which is so-so (and definitely not as good as the cherry or apricot jams I’ve made this year, or the marmalade). I made figs in balsamic vinegar (lovely) and took that a step further by making figs in homemade blackberry vinegar (heavenly) and then came across this recipe from A Mother in France blog site. Not only is this the best fig chutney ever, it’s about as close to Branston Pickle as you could get! For any Brits living overseas who crave Branston but can’t find it this is the recipe to try – and believe me, I’ve tried every Branston copy cat recipe on the internet, none have come close. Source: The Best Fig Chutney in the World……ever! Having been at the quinta now for a few months it transpires that we have many more trees than we first thought. Antonio, our vendor, told us that we have 260 olive trees. That’s a lot of trees, but unfortunately we didn’t get any oil this year. The olive harvest was bad all over our region, and our local press didn’t even bother to open. 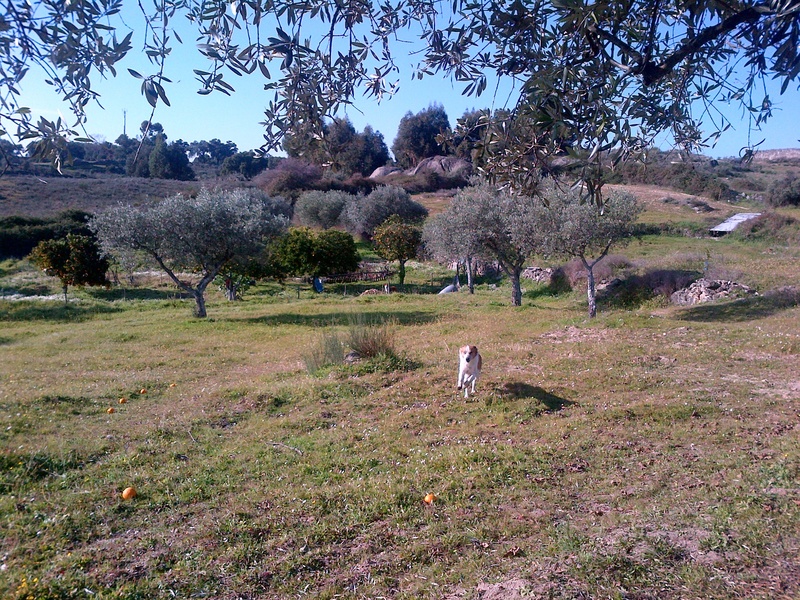 By the time we arrived on 28th November, all the trees were bare, and the olives on the ground. Hey ho – I’m sure next year we’ll have a bumper crop. 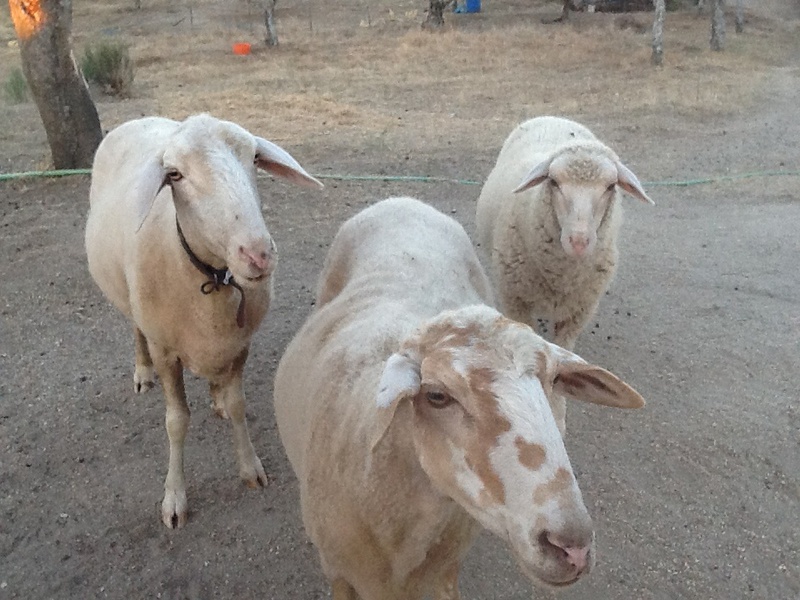 We have 4 mulberry trees, double what we originally thought, which is very good news, mulberries are nutritious and delicious, and chickens, ducks and pigs love them. I’ll make mulberry jam and the animals can eat the rest. We have 15 fig trees, both white and purple varieties, 20 orange trees, mostly navel type, and they have no pips, which is great, and a few bright yellow ones ( no, they’re not lemons!). Additionally we have 12 tangerine type trees, mandarins, clementines, tangerines etc, not sure how to tell the difference. Some are really sweet and some are horrendously sour. 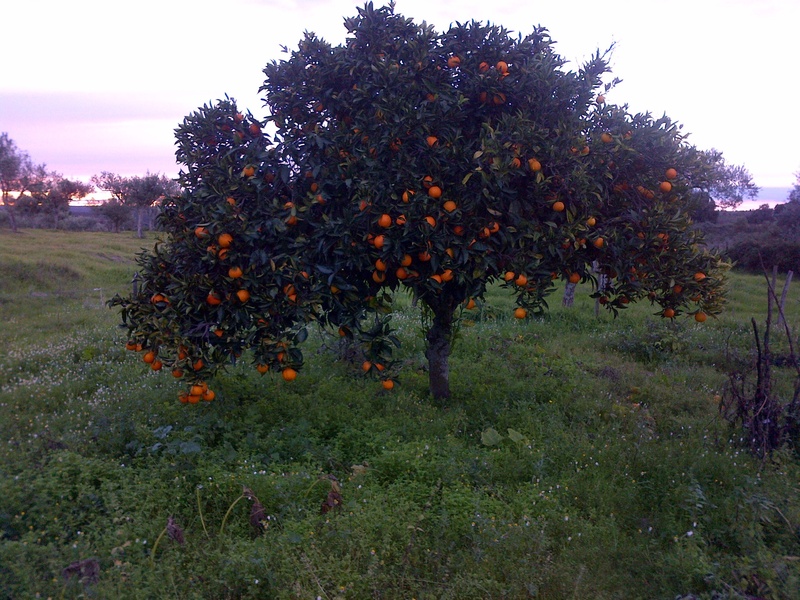 32 orange trees is probably double what we need as they are all heavily cropping, as you can see in the photo, so the plan is to chop down any that don’t taste good or keep well, and replant with other fruit. We also have one peach tree and one apple tree that fruited last year, and 3 fairly immature trees that appear to be cherry, and probably have grown from seeds dropped by birds, as they are in improbable harvesting positions. We’ll move those to the orchard when we know whether they are worth keeping. Additionally, we’ve also planted some trees in December – 2 lemons, a lime, another peach, an apricot, 2 nectarines, 2 red plums and 2 dark/damson type plums. We intend to plant cherry, persimmon, pear, apple, avocado, elder, hazel, sweet chestnut, almond, kiwi and soft fruit bushes next autumn. We have about 50 grape vines, and this years prunings have been stuck in the ground to create about 100 new plants. They will take about 3 years to started producing in useful quantities. My wonderful nephew, Chris, bought me moringa seeds and ash seeds for Xmas, and I’ve sown some in cloches. The moringa for food and medicine, the ash to be coppiced for firewood. We have at least 30 oak trees at different ages and sizes, and a small coppice of mimosa, which I expected to be a problem, it’s incredibly invasive, but actually is great for firewood, one large mimosa log will burn all night, so they can stay and we’ll harvest the larger trunks for firewood and the smaller saplings for pea and bean supports. The raised beds are doing well, we have Roma and beef tomatoes, peppers, chillis, butternut squash, pumpkins, courgettes, sweetcorn, sweet potatoes, garlic and various herbs (I’m not even mentioning aubergines although they continue to grow profusely!). The big disappointment this year has been beans – they just won’t grow, get to about 12 inches then keel over and die. We have 2 broad bean plants that have survived and flowered, but haven’t produced any beans. 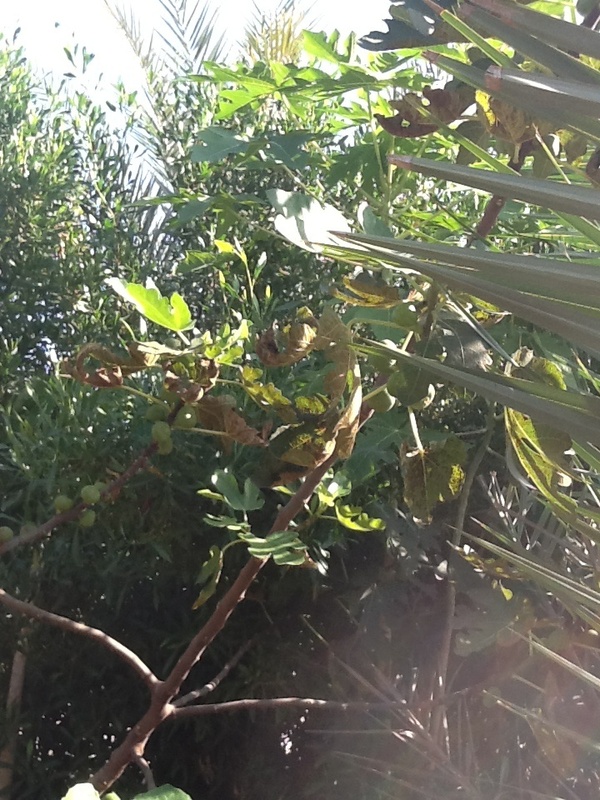 The figs and pomegranates are ripe and we’re harvesting them almost daily, bananas are ripening and the citrus trees have tiny oranges and lemons just starting. The mangos didn’t flower after all the shocking we gave then, so looks like we’ll have to wait another year to eat fresh homegrown mangos. 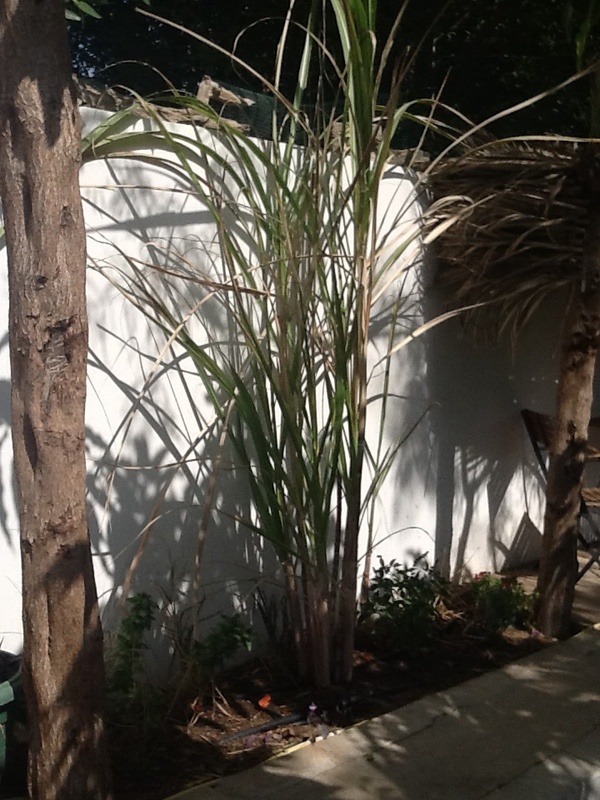 The photo above is a small clump of sugar cane which is almost ready to harvest, we don’t use a lot of sugar, but it’s nice to be able to produce our own cane juice, which I’ll be using for the next batch of fermented ginger beer. One of the mango trees finally flowered and we had about 5 fronds of blossoms, each eventually had approx 10 fruit buds, unfortunately a storm in April blew most of those off and we are left with 2 fruits. Let’s hope they survive to ripen. Not only do vegetables grow quickly here, so do trees. 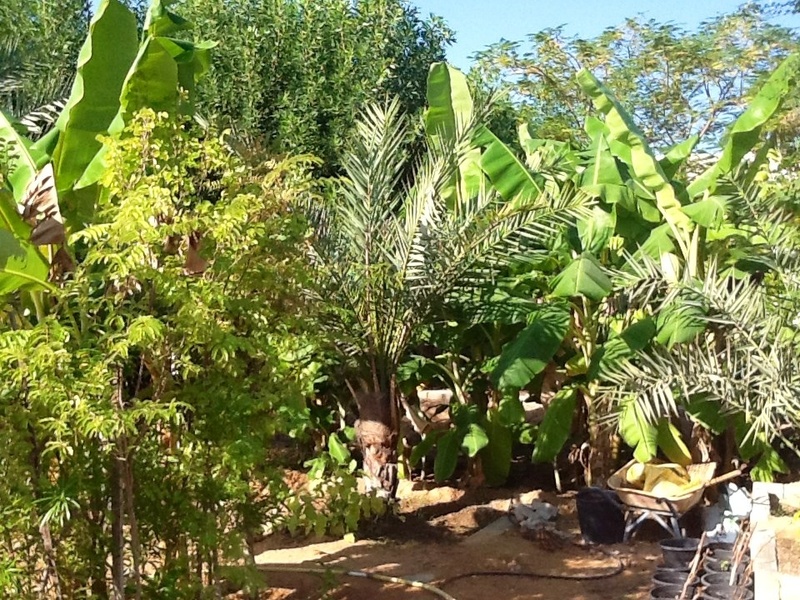 The banana plants in the photo above were planted a year ago and have doubled in size since. They’ve only produced one bunch of very small bananas on one plant so far, which means their energy has been concentrated into vegetative growth. We have 5 mango trees in the garden that were planted 4 years ago, so they should be flowering this year. We’ve cut them right back to ‘shock’ them into flowering, and also to let some sunlight reach the plants growing below them, fingers crossed we get some mangos. They don’t look so great (aesthetically) right now because of the hard pruning, so I’ll post a photo when they are in full bloom. The orange and lemon trees flowered well last winter, their first year after planting, and then had severe bud fall due to 3 days of unprecedented bad weather in April. We eventually picked one lemon, someone else helped themselves to the single surviving orange! Let’s hope we have better luck this year. 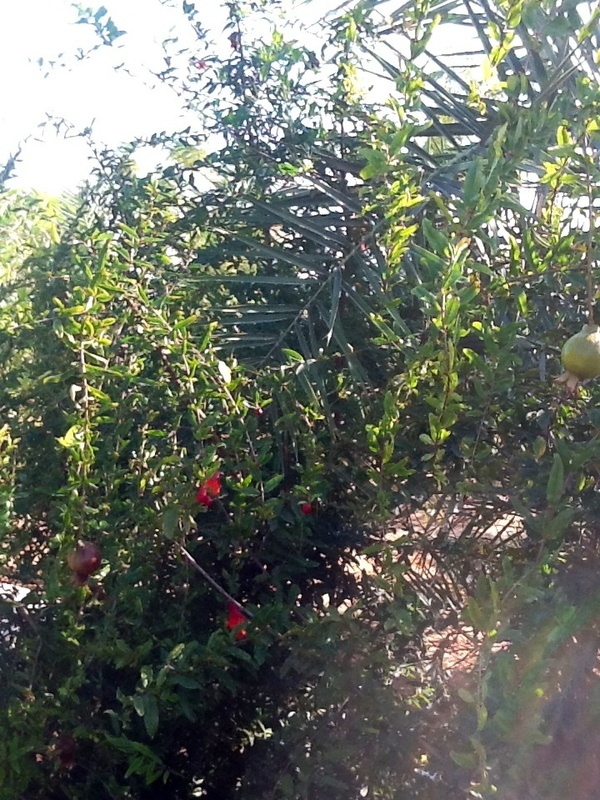 The pomegranate tree above was planted last year and has about 50 small fruits already, so looking forward to eating some of those. The fig tree that was planted last winter is laden with fruit, literally hundreds. This isn’t the best photo but I was trying to also capture the papaya tree in the background, it can just be seen in the top middle section of the photo. We’ve had little success with papaya trees so far, they wilt and die after a few months, they are either too shaded or too exposed, so this one, planted in the middle of the fig and palm trees, and shaded from the mid day sun by the damas trees in the background, is doing really well. We need to plant some others near by and in similar conditions as they are not self pollinating. The plan is to under-plant all of these trees with edible shrubs, perennials and herbs, hence the title of the post. We planted aubergines around the base of some of the palm trees last year and they survived the intense summer sun, we’re doing the same with peppers and tomatoes this year. I’d like to plant some berry bushes and strawberries in the next month or so, and some self seeding plants such as amaranth.